Nationally accepted MiDAS standard for minibus drivers and passenger assistants. 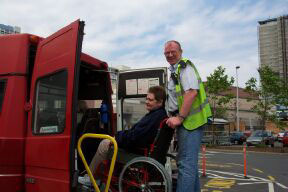 Wandsworth Community Transport is a member of MiDAS (minibus drivers awareness scheme) which is the accepted standard across the whole country. This high standard of training is required of all our drivers and escorts, and is also offered to outside agencies such as schools and other minibus operating groups from the whole region. For more information about all your training needs phone Keith Prout on (020) 8675 3812. We also offer “Train the Trainer” courses so that you can become a registered MiDAS trainer yourself (known as a DAT in the trade). STOP PRESS We also now offer Passenger Assistant Training (PATS) which is a scheme similar to MiDAS but for passenger assistants. It can include extra modules like first aid, manual handling and dealing with challenging behaviour. Drivers who drive as part of their job (teachers, youth workers etc.) and who took their test after 1996 need to do Minibus PCV test to obtain D1 entitlement. See the section entitled D1 Training to find out more.